70 registered members (AML), 472 guests, and 235 spiders. 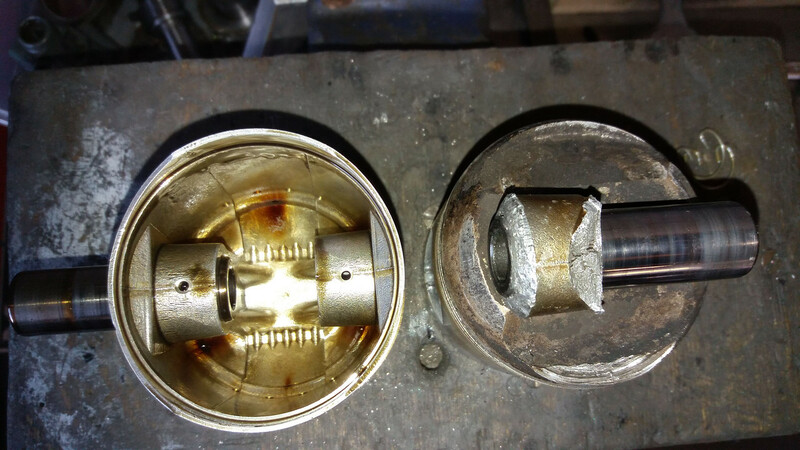 A cautionary tale about the 'genuine' Hepolite pistons being sold by Wassell for our classic British bikes. I bought my 71 BSA Firebird from a chap who'd done a partial restoration including new pistons, fitted into newly +20 re-bored barrels. 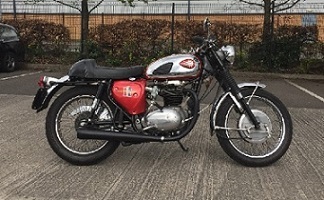 I rode the bike quite vigorously over a 4 year period whilst carrying out further restoration to other parts of the bike, including chrome, paintwork and various upgrades. I had covered around 18000 miles when I was throttling down to about 50mph and all hell let loose inside the engine. I immediately pulled the clutch and coasted to a standstill. After getting the Firebird home and lifting the head, I discovered something seriously amiss with the pistons being at different heights and one being turned though 90 deg. On removal of the barrel, one piston came with it and it's conrod was still carrying the gudgeon pin and the remains of one gudgeon pin boss. The piston had failed in spectacular fashion with both gudgeon pin bosses being ripped out of the piston skirt. Luckily there was no damage to the conrod and only a small crack to the barrel skirt. I showed the piston to several dealers who supply 'Hepolite' pistons, to ask if they had ever seen anything like it, which they hadn't. There's no evidence of the piston seizing or of any pre-ignition. It's as though the gudgeon pin bosses in the piston just decided to let go. If you look at the 'good' piston, you can see at the intersection where the boss meets the skirt, that it's quite a sharp corner whereas a genuine genuine Hepolite or BSA piston they have a generous blend radius. I can only assume that this is a weak spot that could be prone to fatigue failure. It would be interesting to know weather anyone else has had a similar issue with these 'Genuine' pistons. The pin looks a bit blue. You may be hasty to exclude detonation as a cause. The Taiwanese pistons are at least as good as the originals. The piston might be made by JCC although it visually differs from the latest ones I had in hands. 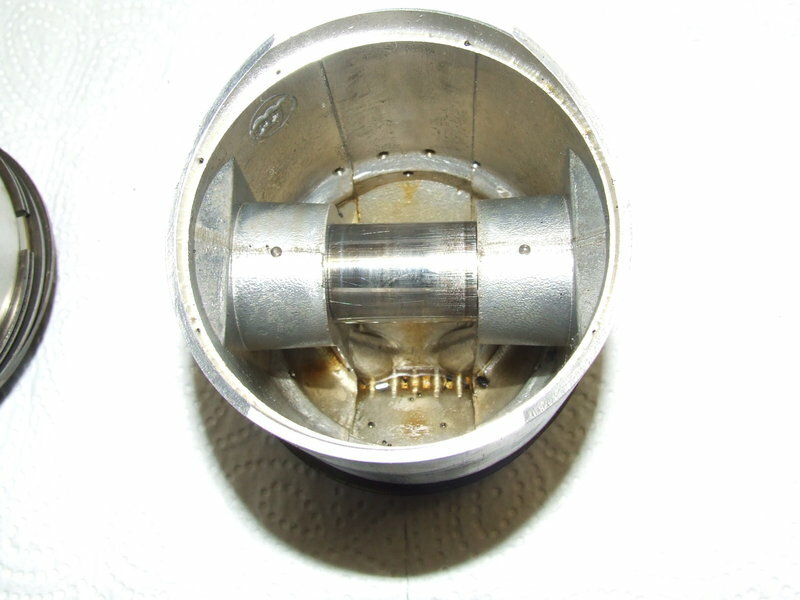 Have you looked at the piston's inside? Usually there is a manufacturer's marking cast in. The one pictured is made byJCC and marked accordingly although it is a +.060". But I have never had any issue with JCC-pistons. I would not discard the detonation issue either looking at the gudgeon pin's colour. 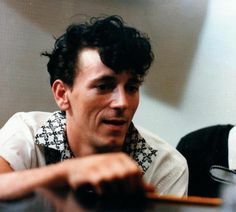 They are JCC. You can just make it out in the photo. Also the bluing on the original photos is down to using a flash and it doesn't look like the pistons have been running unduly hot. If fact the good piston looks like it had been running quite happily. What I don't like about these pistons is the way the ends of the gudgeon pin coincides almost exactly with the 90 deg transition from the gudgeon pin boss to the skirt. I've actually rebuilt the Firebird now and have again used the same type of piston because there aren't many alternatives, but I'm wondering if the same thing might happen again or whether it was a one off! I do sincerely hope your piston failure was a one-off. And yes indeed., piston alternatives are not that readily available for an A 65. Either you go for JP which are quite heavy or you go for GPM which have a reputation for expanding a tad more than JCCs or AE Hepolites if you can get hold of them and are prepared to spend a fortune. When rebuilding my own '71 Firebird I had heated my shop oven and measured the heat expansions of AE Hepolites and JCCs (delivered in a Cyclecraft cardboard box). Since then I am quite aware why I get my barrels honed for JCCs with 12/100 mm clearance, whilst the AE Hepolite could work with 10/100 mm. Unfortunately I did not have a GPM or JP at hand back then. I don’t know what made your piston do that, but there are processes that put stresses on pistons, that they are not made for. Detonation is the obvious one, but that sort of carnage is not usually the first symptom. Certainly worth checking mixture and timing on both cylinders after the repair though. You may have bent the conrod. Another thing the pin bosses don’t like is the hammering effect of loose rod bearings. 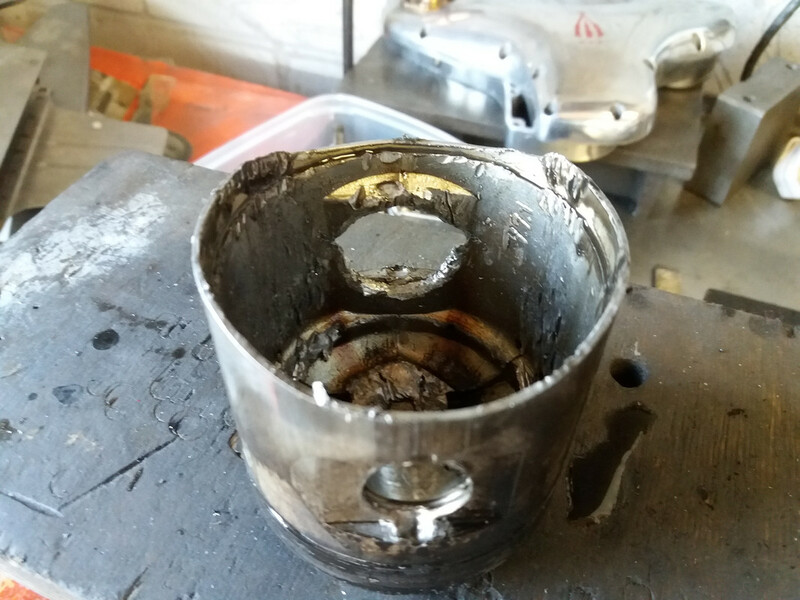 Of course a flaw in the piston could have caused a crack to start and grow, but flaws in these pistons seem to be rare. Detonation and Unit BSA big end problems are not rare. Funny you should mention this. The serviceable piston that I took out had to be heated up to remove the gudgeon pin. The gudgeon pins in the new Hepolite pistons were as easy push in fit cold which surprised me. It would be interesting to know what brought about this change in fit. The new pistons also came with Hastings rings which look to be a big improvement over the ones I took out. A cold push fit is satisfactory, as is a fit that requires the piston to be heated. The dimensional difference is miniscule. Cir clip probably broke or was not fitted correct. Just a guess but have seen that before, makes a mess so you don't know exactly. 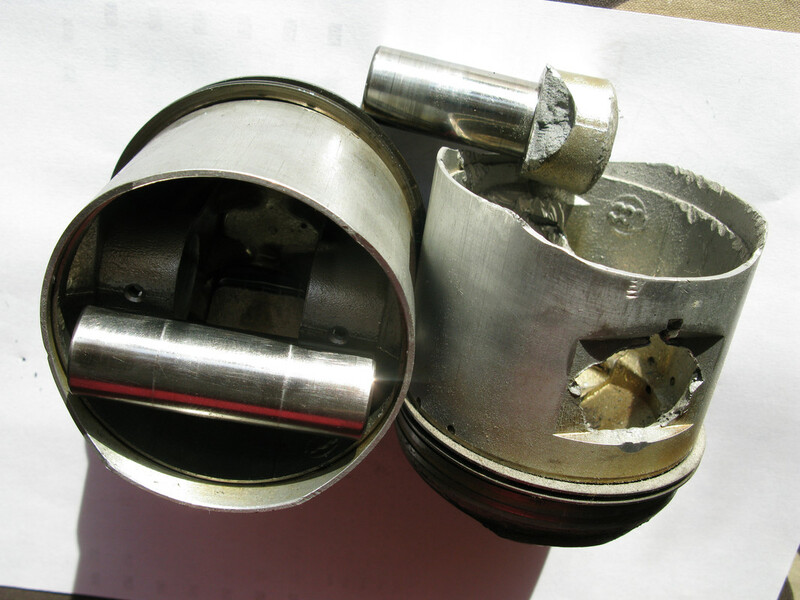 One circlip was still in the piston and the other was intact at the bottom of the engine with all the other shrapnel. It doesn't look like it came outwards from the piston as there's no damage to the cylinder bore. Mystery? Of the one you have seen before was it a Wassell piston? Last edited by Servodyne; 02/03/19 6:42 pm. Or were the clips still in the piston? Ed V in Vermont USA supplies JE pistons, they are about the best you’ll find. You also find quite a few NOS Hepolite Powermax pistons around on eBay. The underside of the piston is showing a bit of baked on oil. Probably a tad too lean at the top end? I believe they were Japanese knock offs. However the cir clip gave way on that one. Sounds like a crack in the pin boss area. No way to know unless your in the habit of zyglowing the pistons before re assembly. A practice I do on older hemis and hi po engines if re using. Always found at least two pistons with cracks in those areas especially on the hemis. reason? Unknown, or due to age and heat cycles.